Gwen Samuels is a Los Angeles based artist. Originally from New York, Samuels attended Syracuse University, where she earned a BFA in textile design. Gwen maintains a studio in Santa Monica. Her work has been represented in numerous solo and group exhibitions both nationally and internationally. She is a supporter of the Venice Family Clinic and is a regular participant in their Silent Art Auction each year. In 2017, Gwen’s work was selected for two highly competitive shows: California Sculpture at the San Luis Obispo Art Museum and Ink and Clay 43 with an honorable mention at the Kellogg University Art Gallery in Pomona CA. She has a two page spread in two of Schiffer Publishing’s newest series: Artistry in Fiber- Volume 1: Wall Art and Artistry in Fiber- Volume 2: Sculpture. Looking ahead, Gwen will have her work in an Invitational Group Show curated by Kate Stern called: Dress Rehearsal at the Oceanside Museum of Art in Oceanside CA. 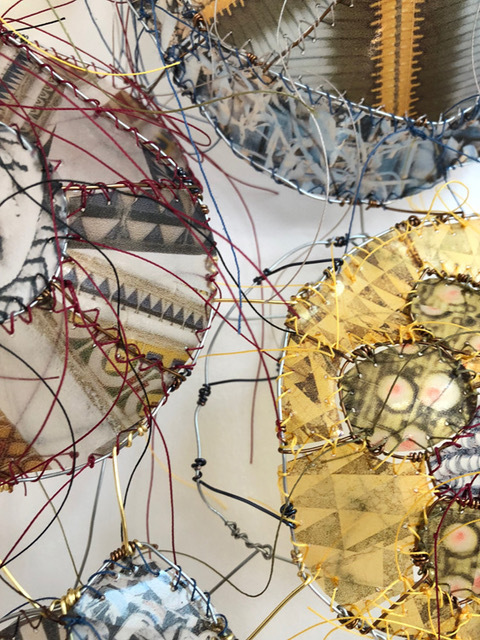 Also later this year her work will be part of another Invitational Group Show curated by Gail M. Brown called: Domestic Matters: The Uncommon Apron at Peter’s Valley Art Center. My work is about transformation. I am interested in reconfiguring shapes and patterns in repeat on a transparent material that interacts with light to create a unique visual experience. From a distance the works function as abstract compositions. Upon closer inspection, recognizable shapes take form supporting the whole object. Digital photographs printed on transparency, hand-stitched to a wire armature.